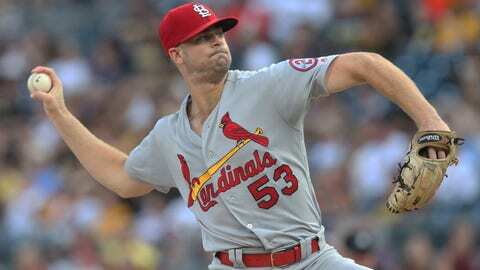 John Gant allowed six runs over four innings in the Cardinals' loss to the Pirates on Friday night. PITTSBURGH — Chris Archer didn’t make it past the fifth inning in his Pittsburgh Pirates debut. However, he still got a standing ovation when he was removed from the game. And his team pulled out a win, too. Adam Frazier’s RBI single in the eighth inning helped the Pirates beat the St. Louis Cardinals 7-6 on Friday night. Pittsburgh overcame a rough outing by Archer, acquired from Tampa Bay earlier in the week, as gave up five runs and seven hits in 4 1/3 innings. He struck out six and walked four. Despite the uneven performance, the right-hander — winless in his last eight starts — received the ovation when he was removed during a three-run fifth inning. Pirates manager Clint Hurdle wasn’t ready to judge Archer after one start. Kyle Crick (2-1) gave up Jedd Gyorko’s tying RBI grounder in the top of the eighth. Felipe Vazquez pitched a scoreless ninth for his 25th save, the most in a season by a Pirates’ left-hander. Mike Gonzalez had 24 in 2006. St. Louis had 15 hits, three each of which came from rookies Tyler O’Neill and Yairo Munoz. Carpenter, Gyorko and Dexter Fowler added two each. The Cardinals left 16 runners on base while snapping a modest two-game winning streak. Fowler left the game in the eighth inning due to a fractured left foot. Cardinals president of baseball operations John Mozeliak said the right fielder fouled a ball off his foot earlier in the game and will likely be placed on the disabled list Saturday. Fowler had struggled all season, hitting just .180 with eight home runs in 90 games in the second year of an $82.5-million, five-year contract. Cardinals: LF Marcell Ozuna (left big toe discomfort) returned to the lineup after leaving Thursday’s win over Colorado and was 1 for 5 with a double. … 2B Kolten Wong (left knee inflammation) is expected to be activated from the disabled list Saturday. … RHP Adam Wainwright (right elbow inflammation) will join the team Monday in Miami and throw a bullpen session. If that goes well, he will start a rehab assignment with High-A Palm Beach. RHP Luke Gregerson (right shoulder impingement) will be examined by Dr. James Andrews sometime next week in Gulf Breeze, Florida. Pirates: RHP Keone Kela was added to the roster and RHP Doyvdas Neverauskas was recalled from Indianapolis while LHP Steven Brault and RHP Nick Kingham were optioned to the Triple-A club. Kela who pitched one scoreless inning in Friday’s win, was acquired Tuesday in a trade with the Texas Rangers. Kingham lost his rotation spot with the addition of Archer.